TransportiCA: February 2018 Book Club Selection: "Energy: A Beginner's Guide"
February 2018 Book Club Selection: "Energy: A Beginner's Guide"
For the February 2018 Book Club selection, TransportiCA has chosen Energy: A Beginner's Guide, by world-renowned author and Distinguished Professor, Vaclav Smil. 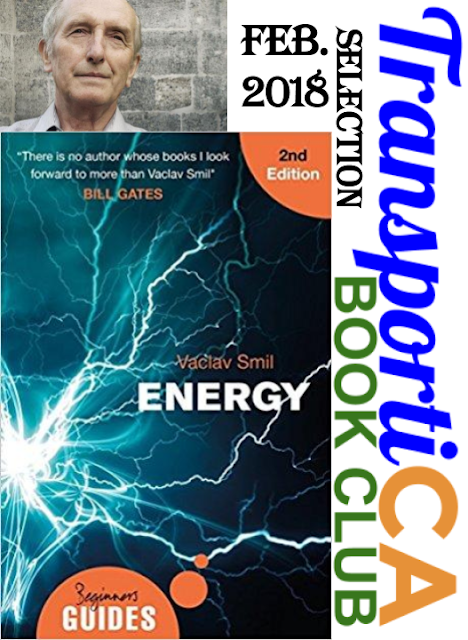 Given the federal administration's detrimental decision to withdraw from the Paris Climate Accord, and because fossil fuels, and other traditional energy sources, are the leading cause of destructive and irreversaible climate change, TransportiCA's Book Club is highlighting energy sources - a major component of sustainable transportation! Smil is long considered a global expert in energy. Unlike with other months, because TransportiCA was delayed in selecting this publiciation, we have waived the quiz requirement - as is typically required for Book Club raffles. However, please submit your name and email address to us, as listed in the next paragraph. No purchase is necessary, Submit your name and email address via TransportiCA's "Contact Form" on the front-page (bottom left). The deadline for submission is 23:59, Wednesday, 28 February 2018. Thank you for your interest in the Book Club, and best of luck!